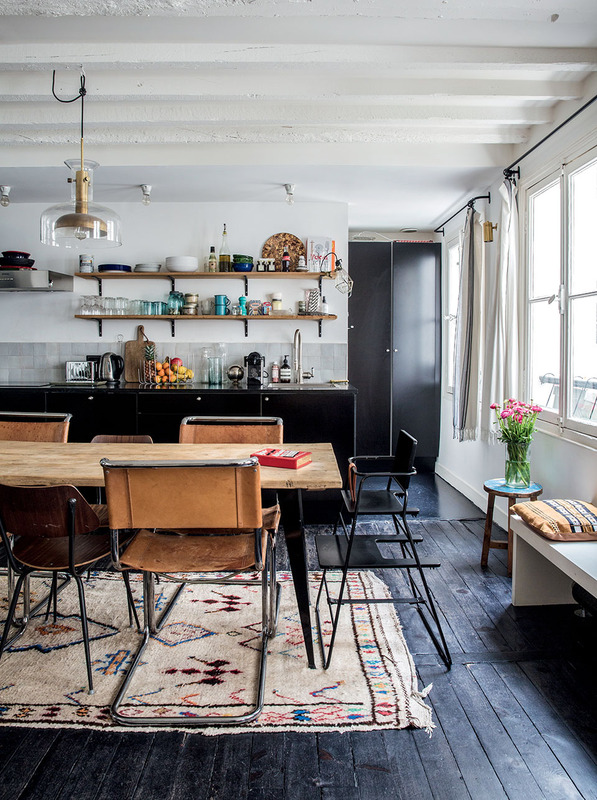 This is the home of Anne-Fleur Broudehoux and her partner Thierry Lebraly, who live in the 10th arrondissement of Paris. I'm really jealous of people whose homes are architecturally as interesting and quirky as this - decorating them must be so fun. In this particular building the rooms are arranged around a central, twisting staircase. The open-plan kitchen/diner/lounge and their baby son's bedroom are on the upper level, whilst their bedroom, the dressing room and the bathroom are on the lower level. You'll see in the later images that the staircase actually intersects and passes through their bedroom above the bed. I love the mish-mash way Anne and Thierry have put together different styles of chairs, tables, decorations, crockery etc. in all different colours. It works because they've left their 'canvas' (i.e. the walls and floor) in neutral colours like black and cream - this way, they don' t have too many colours and patterns jostling for attention. Keeping the backdrop simple has allowed them to experiment with their rugs, art and accessories without everything looking a bit OTT.